Even before seeing Robert Downey Jr.'s awesome performance in Guy Ritchie's film Sherlock Holmes, I had been a fan of the genius detective for some time. For some reason I was always intrigued by Holmes, something about this figure of reasoning and bravery resonating within me. I still consider him to be one of my literary heroes, right alongside Batman. The Hound of the Baskervilles helped bring back some wonderful memories and reinstate my assertion that Holmes is one of the greatest characters in the history of literature. Doyle has a terribly genius way of writing, providing enough details of the scenery to paint a vivid picture without becoming tedious. He gives the background characters enough development to flesh them out but not so much as to detract from the main focus of the story. I couldn't help feeling myself smile a few times while reading through the interactions of the characters, feeling as if they were people whom I had met and talked with myself. Doyle has the mind of both detective and writer, providing all the necessary facts and data but giving them the perfect literary twist to enhance the enjoyability of the prose. The moor is the ideal locale for Doyle's story. It provides a misty, mysterious atmosphere, just the kind of place you'd expect hell spawned demons and spirits to be roaming about. It's a primordial place, the swampy land that the earth was composed of at the beginning of time. How fitting is it that such an ancient place carries with it the superstitious beliefs and fears of an older people? The devil hound is a monstrous symbol of those beliefs, the personified (or is it houndified?) 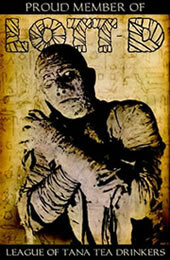 image of the gripping terror that seized the hearts of those first civilizations. 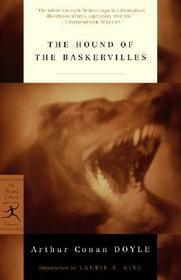 All those anxieties of death and darkness are imbued in the glowing eyes of the Baskerville hound. Its howl strikes a chord in the souls of the characters who hear it, an eldritch cry that summons all the primitiveness inside of them to the surface. To combat these forces of evil, Sherlock Holmes serves as our figure of guidance and reasoning. Although Holmes remains in the shadows himself for most of the novel, his impressive presence is the beacon of light that guides Watson through the thick fog that covers the moors and his own mind. The powers of reasoning have arrived to battle the looming shadow of fear and superstition. It is interesting to see how Holmes handles the situation, this being his most mystical of cases. He keeps his mind entirely open to all possibilities; he does not shun the idea of there being a genuinely supernatural presence on the moor, but he is always on the watch for any signs of a human perpetrator. He is the perfect detective, open to all ideas and theories and ready to battle any force, man or monster, when he is called to action. How can you not love a character like that? Doyle imbues his Sherlock stories with a magic that only he seems to get right, a sense of intriguing mystery that gets me giddy with excitement everytime I read one of his adventures. The mystery is in no short demand in this novel. When one strange incident ends, another picks up after it without losing any steam. A letter is found in Henry's hotel, warning the baronet of imminent danger on the moor. Holmes and Watson spot a bearded stalker tailing Henry in the streets of London shortly afterwards. When Watson arrives at Baskerville Hall, he learns of an escaped convict who is running about the countryside, murder never far from his devious mind. The old butler has a peculiar habit of walking in the halls late at night, as if on some purposeful mission. Just from these examples alone, you can tell that Doyle never allows time for his readers to become bored. You'll find yourself hardly able to put the book down at all, constantly engaged in each moment of the story. If Doyle succeeds in his mission, you'll become so entangled in the goings-on that the mystery of the Baskerville legend will be revealed before you have time to blink. And what is a good mystery without a barrelful of shady characters to occupy the procedures? Everyone in the story seems to have some type of motive, or at least a suspicious foible, that keeps Watson and the reader guessing as to just what is going on. The butler and his wife seem to be hiding some terrible secret from Watson and Henry, evident in the butler's aforementioned prowlings and his wife's midnight weeping. A naturalist and his sister also live on the moor, a hospitable pair of people who seem to open their home and hearts to any passers-by. But there is an underlying tension between the two, the sister mistakenly taking Watson for Sir Henry and thus imploring him to leave the moor at once before her brother discovers what she has said. The murderous convict on the moor creates a heightened sense of danger. Now with two predatory beasts running about, the chances of a two-way trip along the swamp road seem unlikely. And who could that phantom-like watcher spotted on the tor by the light of the moon be? Doyle is a master of weaving these intricate mysteries, all the while keeping the main story of the Baskervilles intact and completely fascinating. The Hound of the Baskervilles is just what the detective ordered. Intriguing mystery? Check. Shady characters and dark deeds abound? Affirmative. Moody atmosphere and terrifying monster for the horror fans? You bet. Perhaps the greatest adventure of the world's most superb sleuth? Oh yeah. So put on your deerstalker caps, fill up your pipes, and take out your magnifying glasses for a little examination into a luminary novel of the mystery and horror genres. You'll soon deduce that the reasons behind the book's greatness are simply elementary. Submitted by Simon Powell on Mon, 2010-06-07 22:48. "Hound..." is one of my favourite Holmes adventures, but some of the short stories (The Devils Foot, The Sussex Vampire and the Creeping Man are the ones I can think of off the top of my head) also have horror elements, with bizarre deaths, baffling situations and people hysterically crying about the supernatural and demonic possession, until Holmes comes in, coolly dissects the situation and finds a rational solution. Submitted by Jose Cruz on Tue, 2010-06-08 18:03. I'm definitely going to have to check those ones out, Simon! Great to see another Holmes fan on the site. Have you read any of the modern Sherlock stories that are out-and-out horror? Particular favorite of mine is "Shadows Over Baker Street" where Holmes faces off the monsters from Lovecraft's Cthulhu Mythos. Wow! Never heard of those. Submitted by Simon Powell on Tue, 2010-06-08 23:00. Wow! Never heard of those. Back in the olden days, as a po-faced teenager, I was sneering and dismissive of anything that wasn't "pure" Holmes (the Jeremy Brett TV adaptions were on at the time, which I felt kind of proved my point), but being a bit more broad-minded nowadays I'll definitely give them a read. Submitted by RandallS (not verified) on Thu, 2010-06-10 14:57. Conan Doyle wrote a lot of horror-related fiction, though his best-known work is the Holmes tales. You might want to read the short stories Lot No. 249, The Leather Funnel, or The Horror of the Heights. Many writers have used the character of Holmes with horror elements, most notably Dracula. Two that immediately come to mind are The Holmes-Dracula file by Fred Saberhagen and Sherlock Holmes vs. Dracula by Estleman. Finally, the Sherlock Holmes short story The Speckled Band has elements of gothic horror like The Hound of the Baskervilles. A group of Sherlock Holmes experts rated the best Sherlock Holmes stories, and chose it as number one. So if you only have time to read one Conan Doyle story with horror elements, I suggest The Speckled Band. Submitted by monroevillezombie on Tue, 2010-06-15 09:10. It may sound kind of lame, but my introduction to Holmes came from seeking out the Moriarty stories after the character appeared on "Star Trek: The Next Generation". This was a time before I was able to check out much classic horror, though, and I was hooked after watching Basil Rathbone in his film version of Hound (which caused me to seek out the novel). It's my favorite of the Holmes stories, although I quite enjoy Neil Gaiman's take on the character in his short story "A Study in Emerald" (which appeared in the previously mentioned Shadows Over Baker Street). On a side note, I've repeatedly told you how much I enjoy these articles, Jose, but you keep making me more and more of a fan as they go on, especially with you mentioning your love of Batman. Kindred spirits are hard to come by, and I'm proud I've found another! I can't wait to see what you pull out of your sleeve next, my friend! Submitted by Jose Cruz on Thu, 2010-06-17 19:27. Randall- I've heard of Doyle's other horror work. I'd like to read some of it some day. I actually have had the pleasure of reading "The Speckled Band" from a volume my college library has. I enjoyed it immensely and can see why people rate it so highly! Chris- That's certainly an interesting way to have found out about Sherlock, Chris. I'm a huge fan of stories that involve well-known characters crossing universes and encountering each other. I think I'm the only one I know of that enjoyed the film version of The Leage of Extraordinary Gentlemen for that reason. Great to see that you're a Batman fan as well! I'm really glad you're enjoying the series and I hope that this week's selection will be as entertaining. Wth all of our similar interests, you're definitely awesome in my book. Submitted by monroevillezombie on Mon, 2010-06-21 10:54. I actually loved LXG on its own merits. I wrote an article about it on my old movie site a few years ago when it was still out in theatres. I now host it at my blog if you'd like to check it out: "A League of Extraordinary Literary Characters"